Still Image via CineLasAmericas “El Techo” highlights the challenges that adults in Cuba face. Everyday life for college students is mostly all the same. Wake up, go to class, study and do class work and fill the remaining time of the day with anything else one can think of doing. While this may be the case for most college students, it is not the same in other countries. 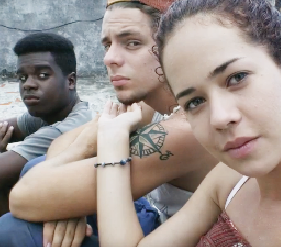 “On The Roof” (El Techo) is a slice of life style movie that showcases what life is like for young adults in everyday Cuba. The movie was directed by Mar & Cielo Productions and was filmed in Cuba. “El Techo” follows the lives of three young adults, two young men, and a pregnant lady whom are all close friends. Each of the friends has a different issue in their lives, and the story follows how the three friends help each other through them all. Victor, one of the young boys is black and is trying to find his Italian entrepreneur grandpa so he can move out of cuba. Victor wants to start a business with Yasmani and Anita, his other two friends. Anita is pregnant and has yet to tell her mother who is away taking care of her grandmother, and Anita does not know for sure who is the baby’s father. Yasmani is a young boy whose father does not want to get out of bed to work because he thinks if he leaves the bed he will spend all their money. By not leaving the house, Yasmani and his father are not making any money at all. The three friends spend a lot of their days on the rooftops of cuba, and eventually start a small business, though it does not last long. The movie is beautifully filmed and excellently portrays what life is like for people in Cuba. It is not easy to get by, and most of the people do not make a lot of money and have to be creative and innovative in order to make a living. The scenes capture the life of these young Cubans very well, and for anyone looking for a slice of life movie this one is phenomenal. The movie currently is only available through the Latino Film Festival and is not yet on dvd or any streaming websites. The Latino Film festival will be held every tuesday for the rest of the month and through October and the upcoming film list can be found on ESU’s webpage.